One sunny day many summers before Alzheimer's ultimately took away her memories, my sister and I visited with our beloved paternal grandmother. She showed us countless pictures, cards and letters from family members we had not seen in many years. It seemed to me on that day that she already had a premonition of what was to come. She was holding on so tightly to anything that would preserve her precious memories of the family she treasured above all else. She seemed to know long before she was diagnosed with this illness, what her destiny would be. Her life was entirely devoted to giving her all to her husband and nine children. 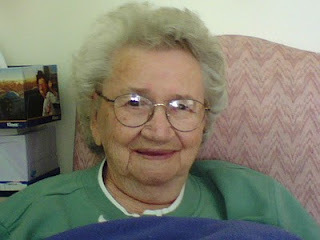 Her pride and joy were her grandchildren and great-grandchildren. An inner voice was telling her to enjoy those memories and share them with those she loved so that they would not be lost forever. I've often thought back to that day. It was just the three of us, so our visit was quite and unhurried. We listened as she talked about ironing stacks of blue jeans for her boys. She told us about getting up early in the morning and starting the fire in the stove in the kitchen so that when everyone got up, the kitchen would be warm for them and breakfast would almost be ready. I'm so glad I thought to ask her where we came from. She looked at me as if no one had ever asked that of her before. "Where did our people come from? Do you know which country?" She smiled and shared the story of how her grandfather stowed away on a ship with only a few coins in his pocket and no knowledge of English. He was only fourteen years old when he and a sixteen-year-old uncle set off on the greatest adventure of their lives aboard a ship bound for the new world. They left behind their whole family in Norway, knowing they might never see them again, to find a better life in America. Many years have passed since that day and our sweet visit with our grandmother. She just turned ninety-six years old a few days ago. She no longer knows who we are or even who she is. My sister and I are getting older too. I wanted to share this story with all those who descended from this wonderful lady so that you may share it with your children someday. Rest in peace dear sweet lady. 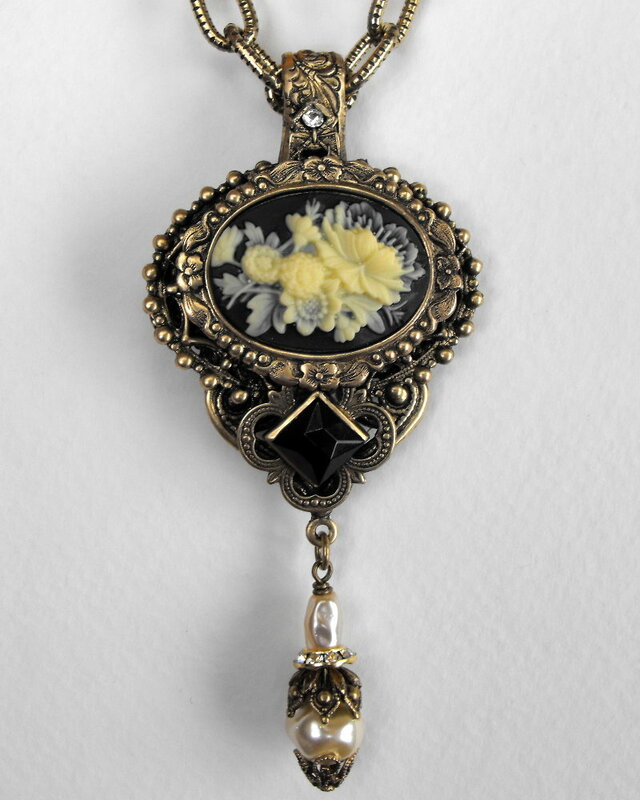 Functional elements such as bails and clasps are required in every project in order to make the piece wearable. Consider a pendant without a bail for example. The pendant would not face forward if you simply threaded a ribbon or chain through its loop. 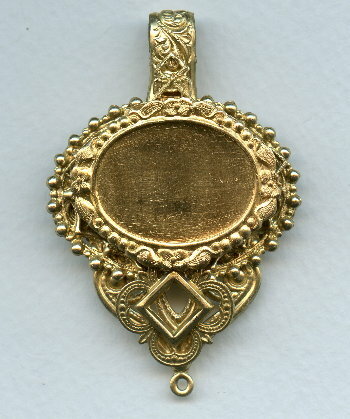 Standard loops are attached to the top of the setting with the hole facing the same way as the setting, so a bail is needed to join the chain to the pendant loop. A bail is often the least attractive component in an otherwise fabulous design. A pretty pendant is missing something if only a simple large rather ugly jump ring is used as a bail. Failing to consider the style of these elements can ruin the balance of an otherwise beautiful piece of jewelry. I believe that every part should complement the main focal point. As in architecture and interior design there are periods that blend well and those which simply do not. 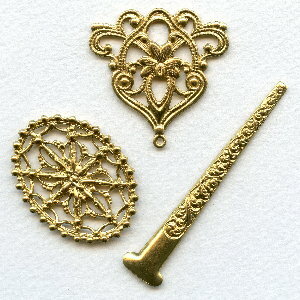 In this lesson I've included some of the new raw brass pieces which just arrived. Raw brass is a great base metal which allows you to experiment with design elements, patinas and even soldering if you wish. 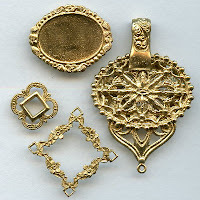 The items pictured above were joined to form the base for a dramatic pendant. 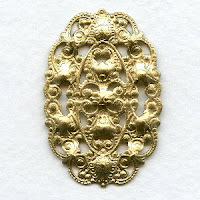 The long narrow embossed piece was formed into the shape of a bail and joined to the triangle with a loop and the openwork oval. I trimmed away some of the wide flat end so that it wouldn't interfere with the lie of the next piece. I added a smaller oval filigree to the back to both cover the glue and reinforce the point where the pieces were joined. Remember to make the back of your piece as pretty as the front. When you are happy with the basic shape of the pendant you have created, let the glue set for a full 24 hours. If you will be adding stones to your pendant you should add settings or bezels to hold the stones. Proper mounts or settings not only protect the stones, they add a finished more professional look to your work. Ensure the settings have a level place to rest. You may have to add a few more elements to the base for stability. The openwork square was the right shape to give the setting a more solid fit. The next step will include adding patina so the glue must have enough time to completely cure. I used E6000 glue so I allowed the project to air dry for a full day before proceeding. In this case the aged patina is achieved by using flat black craft paint. You can experiment with numerous colors of paint but I like the look of aged gilt. I applied paint to the whole piece and right away used an old cloth to wipe away most of the paint. The next step is to use a soft toothbrush to remove even more of the paint. When you have achieved the level of antiquing you desire, you must seal the brass to preserve the finish. There are several products you can use for this, but our Renaissance wax polish is among the best for this purpose. Raw brass is great for manipulating and adding your own patinas but if you fail to seal the piece it will eventually turn to colors you may not like. 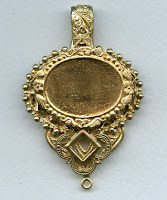 Now that you have assembled, antiqued and sealed your pendant you may add the beading, stones and chain. Your work of art is ready to enjoy. My classmates and I were in a social science class in seventh grade. We were having a discussion about what our lives might be like at the turn of the century. That fateful day was about thirty years away. My little girl dreams came from the only small town life I had ever known. I envisioned a life with a loving husband in a white two-story house in the suburbs of a large city far away. Our children, a boy, and a girl were playing with a golden retriever underneath the oak trees at the edge of our lawn. Simple, sweet, secure was how I saw my destiny. When the waning years of the last century finally arrived, they found me not in a happy home but in the middle of an agonizing divorce from the man I loved so much my heart felt as if it would implode. I loved him even after more than thirteen years of emotional abuse that often left me crying in a heap on the floor. As he drove off into the sunset with his new girlfriend, I stood at the jagged edge of the end of my world. I had invested everything I could borrow and every ounce of energy I possessed into our home and my jewelry design business. When our marriage ended, I had no reliable income to speak of yet. I had just begun to show at the Fashion Markets, and the boutiques were finally starting to buy my work. I had no savings, insurmountable debt and no refuge from this storm. When we sold our home and almost everything we owned, there still wasn't enough to pay all that we owed. ﻿﻿ At forty-five years old I was in deeply in debt, homeless and emotionally destroyed. When an old friend offered me a place to live in exchange for caring for him during his last years of life, I felt as if an angel had offered me his hand. Many years have passed since that ultimate sadness. 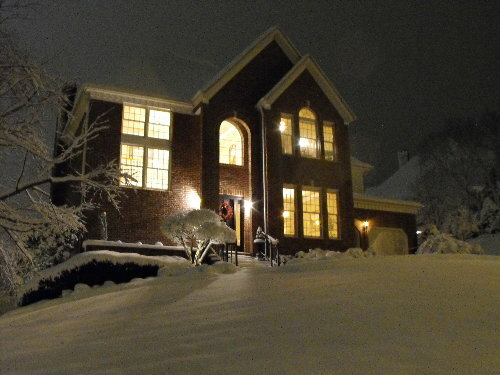 My villa in the snow. ﻿﻿At last, I have a home of my own. It's only a few miles away from that classroom where I dreamed of a happy life so long ago. There are no children, and there is no dog. There isn't even an oak tree. Those dreams of a family of my own never came true, but I do own two businesses, and I am happy spending time with my dear Mr. Mickey. I am very grateful for this part of my life, but it is so different from the one I imagined in the restless dreams of my youth. 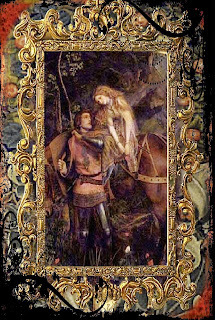 The cost of the materials used to create the work of art has no bearing on the cost of the finished piece. Consider the fact that a Rembrandt is just oil paint on canvas. I've been trying to convey this message to the budding designers who buy their supplies from my company for many years. Artists create a tangible work born from their unique vision. The cost of that finished work of art has no correlation to the cost of the raw materials. This is so difficult for new artists to grasp. If you are paying yourself only to assemble pieces of metal or stone or wire.... you are nothing more than a machine. This is a story I read many years ago but it has remained relevant throughout my life. Thousands of years ago in a medieval village in a far away land a merchant was selling beautiful rugs he had woven with his own hands from humble materials. The rugs were unique in their design because the weaver had been taught the technique by his grandfather. He had been practicing this craft since he was a young boy. His work was flawless and intricate, always a thing of beauty to behold and a treasure to pass on to your children. One morning an arrogant old woman approached his stall in the marketplace. After silently studying his rugs for a long moment, she asked the price of one particularly beautiful rug. When he unapologetically told her the price for the elegant rug, she spat back at him, "What? It's only string!" 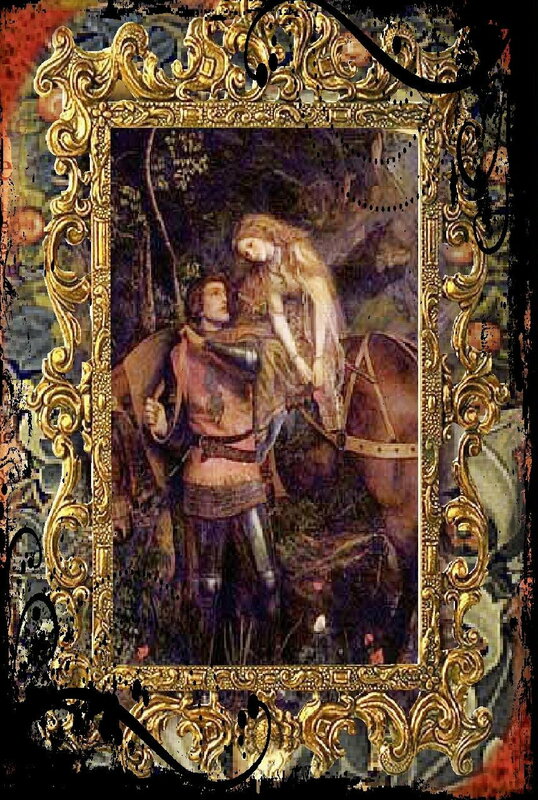 He took the rug from her hands, untying strategic knots and unraveling the whole thing before her horrified gaze. "No madame... now it is only string."